Three exciting days have flown by with some of the most adventurous activities and bizarre events taking place! Congratulations to one of 3rd Tewkesbury Scouts who managed to stand on 24 crates during the Crate Stacking on Monday, using up all the crates and beating the previous record. Both 3rd Tewkesbury and 1st Hibaldstow and Scawby have made the trip to Oeschinensee in the last couple of days to risk a dip in the freezing cold lake (literally don’t think they warmed up for days) and have a go at the adrenalin pumping tobogganing! Glad to say pretty much everyone went in the lake and the fire and hot chocolate afterwards were very helpful in warming up. 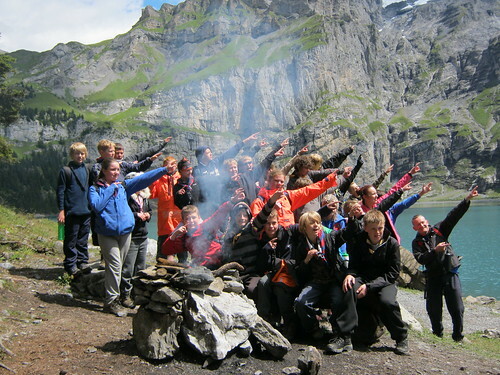 Hikes have been plentiful in the last few days with the scouts completing the Cheesery Hike, taking on the challenging climb up to Bunderspitz at 2546m and the Stand First Hike which takes the group up two mountains overlooking Kandersteg. I accompanied one group on the Gasterntal Hike today, which was strange not to say the least, when we were stopped for half an hour before a rock fall was literally blown up. The noise was unbelievable and you could actually feel it even though we were hundreds of metres away! Evening activities have been packed this week starting with Race the World on Tuesday comprising a series of fun relays with international teams and plenty of healthy competition!! On Wednesday, 1st Hibaldstow and Scawby Scouts went for a meal down in the village trying out traditional pizzas and the salami (which apparently comes from Donkey’s)! Wednesday evening both groups attended the Swiss culture night where they experienced traditional yodelling and music getting a real chance to experience the local area. Currently one of the groups are on Snow and Ice expeditions staying at huts on the glacier while tomorrow sees the other group going up to the Jungfrau and walking the Eiger Trail!